After allowing my newly painted cylinder vases to dry overnight, I moved on to step # 2, applying the crackle glaze. I like the Martha Stewart brand of Crackle Effects. 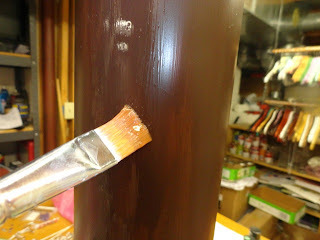 It is easy to apply, easy to clean out of your brush, and easy to apply the final paint coat to. No preparation is needed in order to apply the crackle effect to your painted surface. I like to give my newly painted item a chance to fully dry before applying. I did the base painting last evening and allowed it to dry overnight. You may not have to allow that much time, but I like to make sure the base coat is fully dry before moving on. I would think you need to allow at least a few hours in between painting the base and adding the crackle effects for success. Make sure you read the manufacturer's directions. I just apply with a 3/4 One Stroke paint brush. Do not over work. I quickly apply this solution by loading my brush and making one continuous stroke from top to bottom. Do not stroke back and forth or continue to go over the same place. This was my final vase to coat with the crackle effect. This particular vase was the first one I painted while trying to figure out what I was going to do. It actually had been crackled with a lighter green. 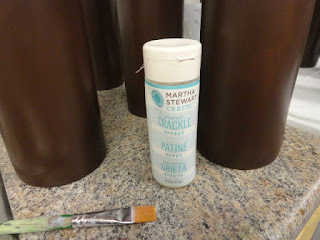 Once I realized I needed the vases to be a different shade of green, I repainted the vase the brown again. I just added the crackle effect and will add the new shade of green when I paint the others. 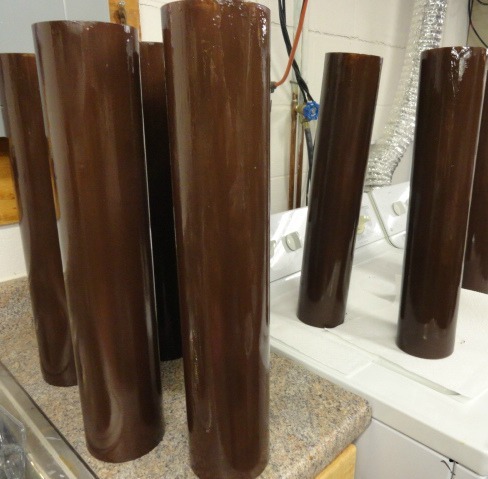 Look how shiny they are after being coated. I am going to allow these to dry overnight once again. Tomorrow will be the day I add the final coat, which will be green.